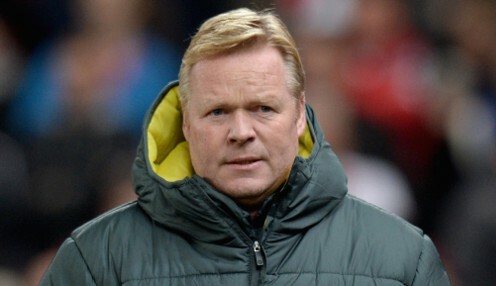 Ronald Koeman admits his Netherlands side need to believe they are ready to beat Germany in Saturday's Nations League clash. The pair meet in League A Group 1 and both have something to prove, with Die Mannschaft falling at the first hurdle in their defence this summer in Russia. However, the Oranje have failed to make the last two major tournaments and Koeman has put his faith in youth as he aims to rebuild his country's reputation. Do my players realise that we can beat Germany? That is very important. After taking over in February, the former captain lost his first game in charge to England 1-0 but then oversaw a run of four unbeaten before losing 2-1 to France last month. Despite the result, there were plenty of positives to take from that defeat in Paris and Koeman is keen to kick on against Germany, who play Les Bleus on Tuesday having drawn their September meeting 0-0. The 55-year-old says his young squad set themselves a benchmark with their performance in Paris. After a tough few years for Dutch football, Koeman has now challenged his players to believe that they can get a result against Joachim Low's men. "I expect us to reach the levels of against France and continue that longer," he said. "If that works, I think we're going to win. "Do my players realise that we can beat Germany? That is very important. "The feeling that you can achieve something and that you actually get it done. I have a very good feeling about that." The Netherlands are 5/2 to win on Saturday, with the draw 13/5 and Germany 23/20. Koeman's side can be backed at 4/5 to top their Nations League pool, with the Germans 12121/1 and Didier Deschamps' world champions 10/11.